Cartier is building upon its celebrated Calibre collection of watches with the addition of a chronograph version, to be released in 2013. The Calibre collection was first released in 2010, the first mass-produced series of Cartier watches to feature a movement made in-house. This was an exciting development as Cartier-made movements had previously only been a feature of Cartier’s highest-end peices. Since the Calibre collection first hit the wrists of Cartier fans everywhere, the company has built upon the original designs by adding bracelet options and now—a chronograph. The movement of the new Calibre chronograph is the new Manufacture chronograph movement, 1904-CH MC. This new self-winding movement features a precise setting system and an internal ceramic ball-bearing system used to counteract the strong pressures the movement is subjected to, ensuring the movement’s extreme durability. The self-winding mechanism of this movement does not depend on the traditional reversers but rather an innovative click system, which increases the chronograph’s winding speed—something also aided by the two-direction winding system, which ensures that the movement is wound whatever the direction of its rotation. As the first self-winding chronograph movement produced by Cartier, the chronograph will be making a splash with eight models to be available and leather strap or metal bracelet options also available from the very start. The chronograph face is symmetrical, featuring sword-shaped hands. The upper half of the watch features Roman numerals and the lower half tickmarks. On either side of the dial are the chronograph counters, which tell the minute and hour. 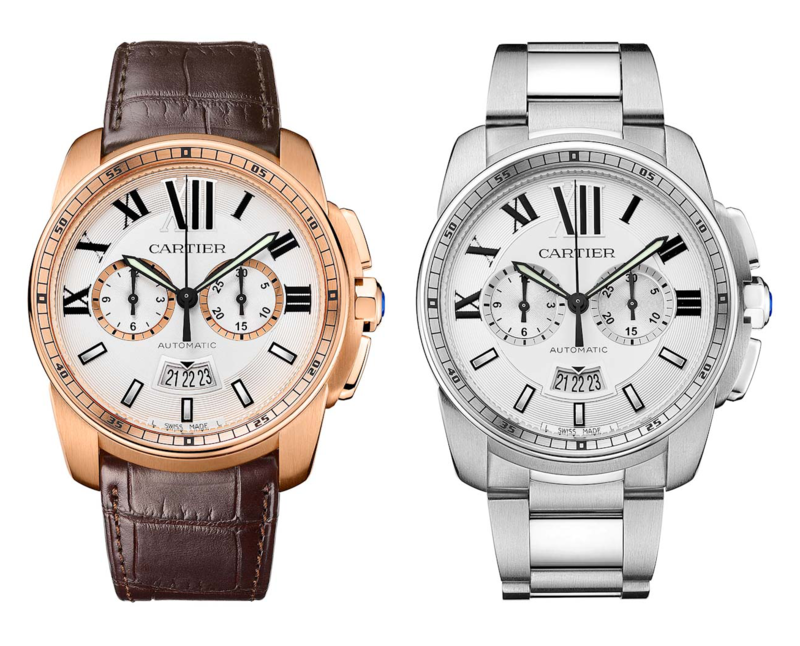 An enlarged date counter is position in the 6 o’clock position, mirrored by the Cartier logo at the 12 o’clock position. The overall look is of a clean, stylish timepiece, one that retains the familiar and celebrated Calibre caseshape but but nevertheless showcases Cartier’s latest in-house movement. This latest offering from the Calibre collection is sure to be a hit with fans of Cartier watches everywhere, and more exciting timepieces are sure to come from the brand. In celebration of this year’s Monaco Grand Prix, held earlier this year, TAG Heuer released four new chronographs in Monaco—the official timepieces of the most glamorous race in the world. TAG Heuer’s relationship with the Monaco Grand Prix and Formula One racing is a long and storied one, stretching back to 1960 when Swiss driver Jo Siffert became TAG Heuer’s first Grand Prix Ambassador. However, it was TAG Heuer’s association with the American actor and driver Steve McQueen that produced the most iconic result of their relationship with F1 racing. For the 1970 film “Le Mans” McQueen was sent a case of TAG Heuer watches and chose a then-revolutionary Heuer Monaco chronograph, with its square casing and distinctive blue coloring. The watch was the first ever with a waterproof square casing and the first with an automatic self-winding chronograph. Since then the “McQueen Monaco” has become one of the most sought-after vintage watches on the international market. These four new releases from TAG Heuer have been designed in honor of the Monaco Grand Prix and Steve McQueen’s iconic timepiece. The watches released were the Monaco Calibre 12 Chronograph ACM Limited Edition, Monaco Heuer Calibre 11 Chronograph, Monaco 24 Calibre 36 Chronograph, and the Carrera Calibre 16 Chronograph Monaco Grand Prix Limited Edition. The Monaco Calibre 12 Chronograph ACM Limited Edition was released in limited run of only 1200 pieces and is a luxurious tribute to the Automobile Club de Monaco. This watch features silver sub-counters with an exquisite finish and a soft black alligator leather strap with bold orange stitching. The watch’s face is emblazoned with MONACO and the TAG Heuer logo in the 12 o’clock position, balanced by the crest of the Automobile Club de Monaco at the 6 o’clock position. The Monaco Heuer Calibre 11 Chronograph is a modern update on the classic “McQueen Monaco”. This watch features a dark blue strap of perforated leather and a stylish blue dial decorated with white stripes inspired by the design of McQueen’s racing gear. The Monaco 24 Calibre 36 Chronograph is another variant on the “McQueen Monaco”, one that is both super-charged and super-tough. The blue dial of this timepiece is a combination of the classic square-faced watch and sporty racing stripes. The chronograph’s construction, tubular design, and emphasis on shock-protection for its components are all award-winning features that echo the high-powered precision of F1 racecar technology. The final watch is the Carrera Calibre 16 Chronograph Monaco Grand Prix Limited Edition, released in a run of just 3000 pieces. This one breaks from the other three in that is based on the watch released in 1964 as a tribute to the grueling Carrera Panamericana Mexico road race. This modern version is a Carrera-inspired homage to the Monaco—the most exciting, dangerous, and grueling of event in modern road racing. With these four timepieces TAG Heuer has paid fitting homage to not just the Monaco Grand Prix but F1 racing as well. In November 2012 the Laureus Sport for Good Foundation held its sixth Laureus Charity Night, raising a record CHF 444,000 to help disadvantaged children in Switzerland. The Laureus Sport for Good Foundation was co-founded by several Swiss institutions, including IWC Schauffhausen. The Foundation is focused on providing socially, economically, and physically disabled children and adolescents in Switzerland with the opportunity to participate in sports that they might not otherwise have. 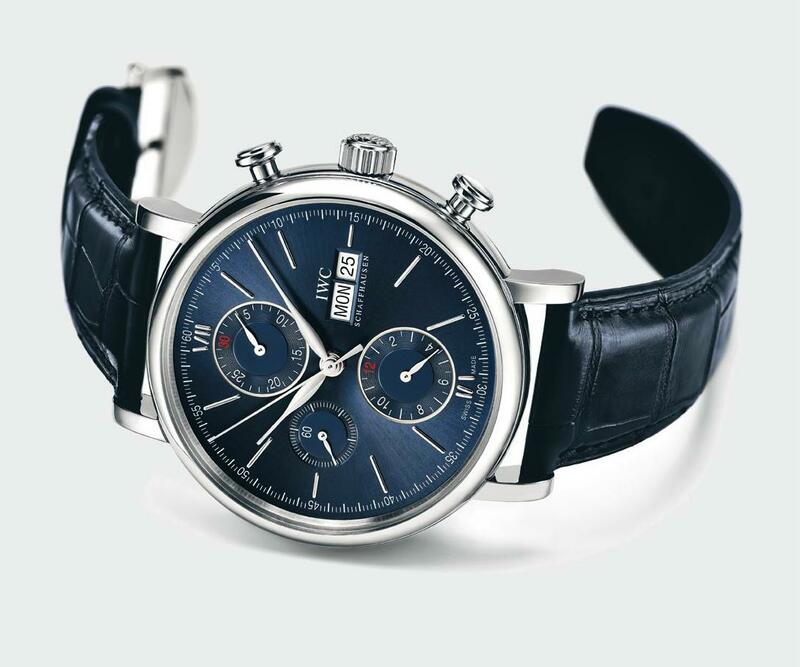 The IWC Spitfire Perpetual Calendar Digital Date-Month Laureus Charity Night Edition, as the watch is called, is a unique timepiece with an elegant dark blue and platinum design. The watch’s face displays both date and month in digital form, and the open case back puts the internal rotor on display as a Spitfire silhouette. As a reminder of its origin this special edition watch is engraved with the worlds “Laureus Charity Night Zurich 2012” and the limited edition number of “1/1”. This watch raised an impressive CHF 140,000 in the auction. We applaud IWC Schauffhausen for their commitment to the Laureus Foundation and its philosophy that sport has the power to change the lives of young people for the better. This month fashion icon Daphne Guinness and Swiss watchmaker Roger Dubuis have teamed up to promote Roger Dubuis’ latest collection, combining Dubuis’ timepieces with Guiness’ style. Daphne Guinness has long been considered an important figure in the world of fashion, being a well-known collector of haute couture and a revered style icon. She is an artist who has herself inspired other artists, serving as muse to famous photographers and art directors. It is as muse that she has come to collaborate with Roger Dubuis, a talented watchmaker whose name graces the brand he launched in 1995 with the help of Carlos Dias, another designer of fine watches. As the latest celebrity to partner with Roger Dubuis, Guinness has lent the brand’s stylish timepieces the stamp of her approval—approval that did not come lightly. According to Haute Living magazine, before she would consent to becoming an ambassador for Roger Dubuis the heiress insisted on visiting their factory herself in order to ascertain that the quality of manufacturing that went into a Roger Dubuis watch was up to her stringent standards. Only then did she become ambassador for the Velvet collection. To celebrate the launch of the Velvet collection, Daphne Guinness collaborated with the celebrated fashion photographer Nick Knight on a photoshoot that showcased the watches. The photoshoot was styled by the Daphne Guinness herself and features vintage clothing from her personal wardrobe. The results of the photoshoot are exceptional, each one capturing not only Guiness’ style and grace but each watch in the Velvet collection to perfection. Together they exemplify the “fascinating and daring appeal” of the Velvet collection. The resutls of the photoshoot also include a short making-of video that takes viewers into the world of high-fashion photography. As for the watches themselves? The Velvet collection combines stunningly precise mechanisms with a glamorous design. The centers of the Velvet watches are marked by a barrel-shaped inset, creating an interesting depth effect on the watch face. 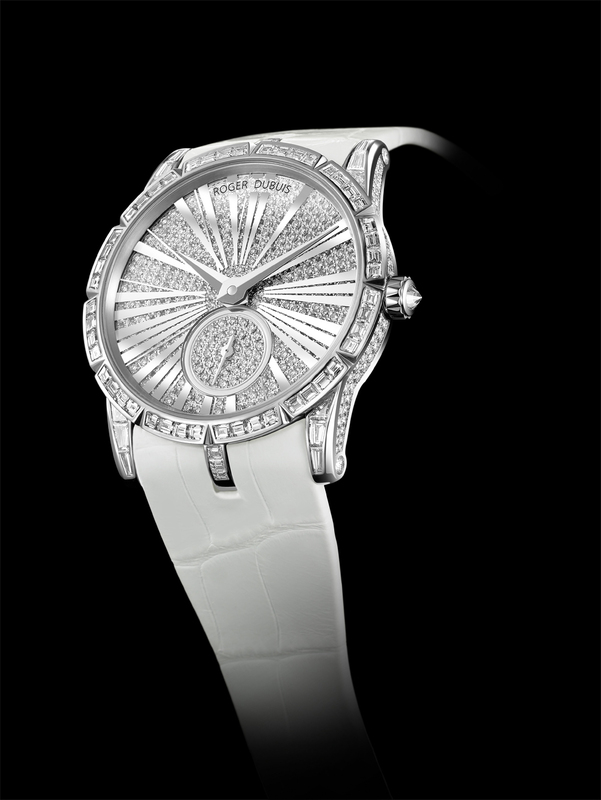 Gleaming Roman numerals and appliqued designs all converge towards the center of the watch, drawing the eye inward. The watch casing itself is designed in a shape that sits halfway between a circle and a barrel shape, and gems line it in shapes that echo both forms. The watches of the Velvet collection come in a variety of colors and configurations, ensuring that there’s one to fit any aesthetic. Looking forward, it’s hard to say where this partnership might go. However, with Guiness’ deep appreciation for the skill and craftsmanship that goes into a Roger Dubuis watch, it’s safe to say that we can expect great things from their collaboration. Corum’s latest iteration of its celebrated Admiral’s Cup watch has broken the mold with its COSC-certified chronograph movement. The Admiral’s Cup is an international series of yachting races, and for many years was considered to be the unofficial world championship of offshore racing. Corum has been a supporter of the Admiral’s Cup almost since its inception—the race was first held in 1957, and Corum released its first Admiral’s Cup watch three years later in 1960. That early watch was square in shape, had a sailboat engraved on its back and naturally was designed to be water resistant. Since then Corum’s Admiral’s Cup watches have come to repesent the best of the brand’s sports watches. That reputation has remained even though the current Admiral’s Cup watches are a far cry from their early progenitor. Now they are marked by distinctive twelve-sided bezel, which is decorated with twelve nautical pennants from the International Maritime Signals Code [DOUBLE CHECK]. The watch retained those features through last year’s redesign, when Corum created the Legend line to house its Admiral’s Cup watches. 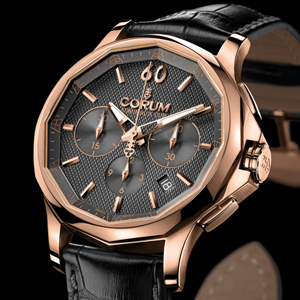 Now Corum has improved yet again on that classic design with this year’s Admiral’s Cup Legend 42 Chronograph. This new timepiece retains the distinctive shape and pennants of its predecessors but stands out from the rest as it is the only one of the line that has a COSC-certified movement. COSC, or Contrôle Officiel Suisse des Chronomètres, is the Swiss organization that is in charge of certifying the accuracy and precision of all wristwatches in Switzerland. Corum’s Admiral’s Cup Legend 42 Chronograph features the Caliber CO983 movement, which beats at a frequency of 28,800 vibrations per hour and has a 42-hour power reserve. This beautiful watch represents yet another step forward in Corum’s question to make each Admiral’s Cup timepiece a celebration of not only nautical skill but clockwork craftsmanship as well.